For those of you keeping count, we are now on the fourth coat/attempt to make the library look more livable. It’s going to stay this way at least thorough the new year. For our first (and probably last) foray into the field, we did well enough. Sure there are mistakes, but right now I have my back to them. I think that we’re going to have to install some molding to take care of the “cutting in” issues at the join of the wall and ceiling. Before this latest venture it was much easier to simply paint the ceilings the same colour as the walls. So, for now, this is the way that we live. The next step is to save the pennies, dimes and champagne budget to cover the cost of a professional consultation and work crew. But there is a New Year’s party to throw first. One has one’s priorities. And don’t worry Mr. Worthington, the lights will be out. This entry was posted in Living and tagged faux finishing, strié. Bookmark the permalink. That looks pretty cool. Sort of like cedar. Have a great holiday season!! Brave of you, Mr E.
Striated walls are not easy to pull off. I rather like the effect, reminiscent of Mrs Lancaster’s gothic bedroom at Hasely Court, painted “an unsentimental orange”. Thanks, both. It is more of a “blood orange” result. Interesting, anyway. I’m still not sold, but like art, sometimes I have to live with it until I can make the final decision. The lights are on dimmers at any rate. without that telltale build up of glaze. 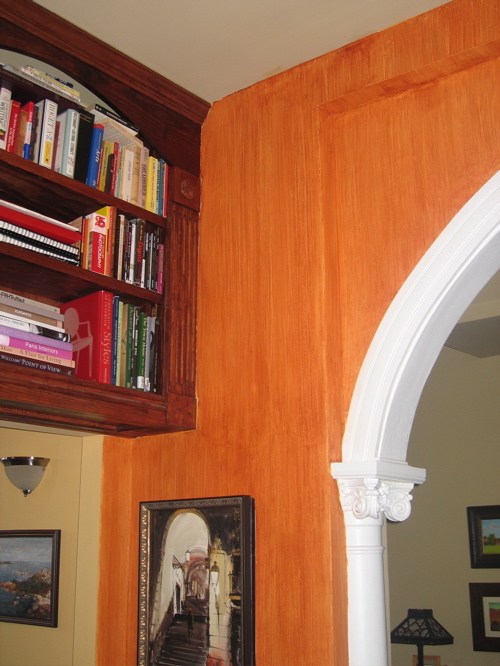 Even the most experienced painters will opt for that extra bit of moulding to cover the ragged edges or else apply a narrow band of braid or border. How about ribbon edging (black or patterned) that takes the all colors that come together in the corners as a way to finish it off and tie it all together. Kind of the way the painting does. I think you’ve done a good job. It’s hard enough just doing a straight paint job. I have a red sitting room that took five coats to cover the previously white walls. Oh, stop – it looks great! Remember what one of my favorite decorator friends told me a very long time ago, “No one looks up, no one looks down.” She’s completely right. I’m quite impressed as this kind of thing can go quite badly and you have done a fine job. Perfection lies in the imperfection. It is very, very swell indeed. Oh dear, dare I comment or not. – you may need intervention with this one. Pity you are not next door, I would run over in a jif. I see a charcoal gray paint, matte. I have looked at this again and amazed at your attempt. I can barely push a paint roller! And here you have done something quite grand. How long did it take? Hello Mrs. PvE, it’s staying this way for a while. At least until I can figure out a paint scheme that we both love. Farrow and Ball is in our future! I love grey (my teenage bedroom was grey with white trim), but fear that charcoal might deaden the space too much. Thanks for the offer to help, though! AL, most of a day. Mrs. E. did a few hours with me until the demands of the children outweighed my complaining… Hers is the more professional finish. She did have the drywall whereas I was stuck with the plaster. As I said, there are a few mistakes, but overall, I’m proud of the job we did. It has emboldened us to do the horizontal gold tone stripes in the bedroom.